Bernard Ruiz-Picasso and the Councillor of Culture of the Regional Government of Andalusia Miguel Ángel Vázquez, en el Museo Picasso Málaga. From 26th February to 2nd June 2019, Museo Picasso Málaga will be examining the life and background of Olga Khokhlova, Pablo Picasso’s first wife, in the first show of its 2019 exhibition calendar. Olga Picasso looks at the years they spent together, putting into perspective the creation of some of Picasso’s greatest works and reconstructing this body of work in the context of a personal story that developed alongside another political and social one. Picasso’s model par excellence, his imagined figure of Olga underwent a metamorphosis during the years of upheaval in Europe between the wars, as their relationship gradually deteriorated. Some 350 pieces will be on display, comprising paintings, works on paper, documents, letters, photographs and films. The exhibition is jointly curated by Émilia Philippot, conservator at Musée national Picasso - Paris; Joachim Pissarro, professor of art history and director of Hunter College Art Gallery (New York); and Bernard Ruiz-Picasso, co-chair of Fundación Almine y Bernard Ruiz-Picasso para el Arte, FABA. The exhibition was shown at the Museé national Picasso-Paris from March 21 to September 3, 2017. It will displayed at the Pushkin Museum in Moscow from November 19, 2018 to February 4, 2019, before travelling to Museo Picasso Málaga. The last venue will be Caixa Forum Madrid next September 2019. Eugen Blume, from Germany, and MPM artistic director José Lebrero Stals, the exhibition brings together around a hundred works which display the wide range of techniques that Nauman employs, such as video, sculpture, installation, neon lighting, architectural structures, photography, and drawing. This is Nauman’s first major exhibition in Spain for 25 years. Finally, from 24th September 2019 to 2nd February 2020, Calder-Picasso will be the first exhibition in Spain to explore the creative connections between two 20th-century modern masters: American artist Alexander Calder (1898-1976) and Málaga-born Pablo Picasso (1881-1973). While the dialogue between Calder and Picasso is filled with endless possibilities, a vital connection can be found in their exploration and exploitation of the void, or the absence of space, which both artists delineated from the figure through to abstraction. Calder and Picasso each dealt with the attributes of presenting or representing nonspace, whether by giving definition to a subtraction of mass, as in Calder’s sculpture, or by expressing contortions of time, as in Picasso’s portraits. Calder externalized the void through curiosity and intellectual expansion, engaging unseen forces in ways that challenge dimensional limitations, or what he called “grandeur immense.” Picasso personalized the exploration, focusing on the emotional inner self: bringing himself inside of each character and collapsing the interpersonal space between author and subject. 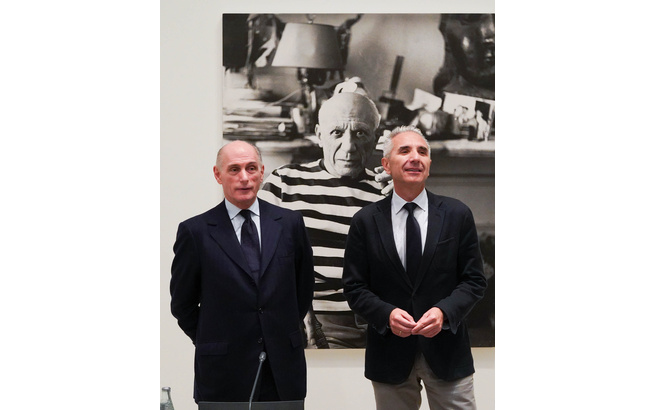 Organized in collaboration with Musée national Picasso Paris, Calder Foundation, New York and Fundación Almine y Bernard Ruiz-Picasso para el Arte, Madrid, the exhibition will open for the first time at the Musée national Picasso Paris in February 2019. Jointly curated by Alexander S. C. Rower, Calder Foundation; Bernard Ruiz-Picasso, FABA; Claire Garnier and Emilia Philippot, Musée national Picasso-Paris, in the Museo Picasso Málaga it will showcase around 110 artworks. Each of the three exhibitions scheduled for next year will be accompanied by a programme of cultural activities that explore the main artistic and historical aspects they cover.